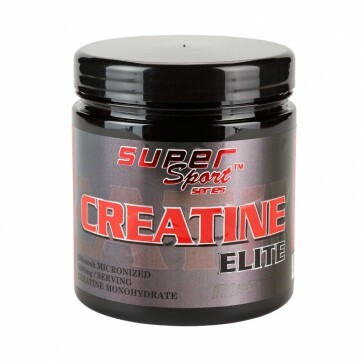 Micronized Creatine Monohydrate (200mesh) that ensures strength, endurance and energy during exercise. Take 1 dose before training for more strength, energy and rapid muscle growth. Creatine monohydrate is one of the oldest types of creatine proven over the years as a superior product to enhance strength and endurance during exercise. It was discovered 200 years ago and is widespread in sports and bodybuilding. Creatine is found in natural form in the body, such as amino acid in the kidneys and liver. Transported through the bloodstream by means of muscle contraction. Approximately 95% of total creatine in human body occurs in skeletal muscle, where it decays to adenosine tri-phosphate (ATP) percentages of zinc ATP in skeletal muscle is usually small. Muscles benefit from it only for a few seconds. A dose of 5 grams of creatine monohydrate can increase blood plasma levels with 1-2 units, helping to increase strength and build muscle mass. Normally taken between 5 grams, 20 grams per day for a period of 30-45 days without side effects. DIRECTIONS OF USE: Helps for more strength, energy and endurance during exercise or competition. Helps for faster recovery and natruvane muscle mass. Take one dose before and one dose after training. Non-workout days take one or two doses distributed throughout the day. INGREDIENTS: Micronized Creatine monohydrate 200 mesh. Use only as a dietary supplement! Do not use if pregnant, lactating women and children! Keep out of reach of children! 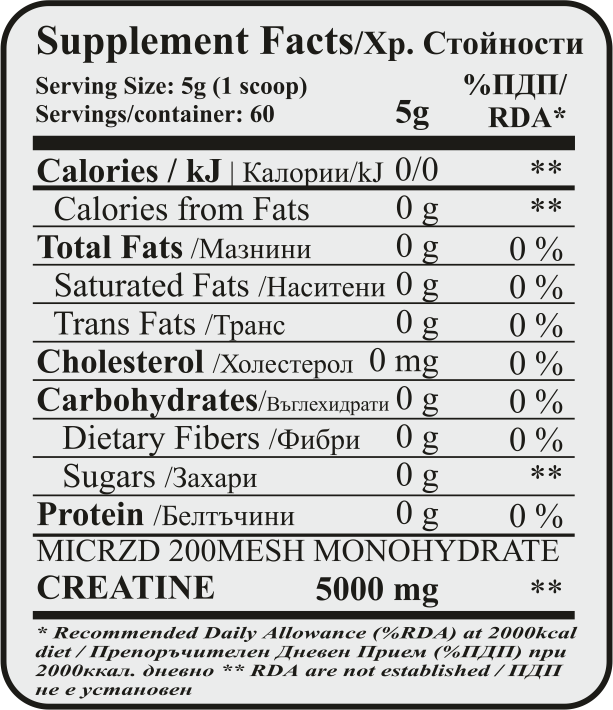 Do not exceed the RDA indicated in nutritional values. Dietary supplement that can not replace a varied diet! It is not medicine! Use before the expiry date, marked on the packaging / L. Store in a cool dry place to 28C without direct sunlight.